A plaque in memory of John Paul Jones will be revealed on July 6 at House 23 on Bolshaya Morskaya street where Jones lived. This was announced today by Scott Fry, a commander in the US navy. Mr Jones was an admiral in the Russian fleet under Catherine the Great and in the US he is considered one of the founders of the US navy. Mr Fry arrived in Saint Petersburg today on the Nicholas frigate. He will meet Russian political and military leaders and take part in ceremonies to commemorate the life of the US and Russian sailor Jones. Mr Fry said the aim of his visit is to 'bring US good will to the city and also in order to promote greater naval collaboration. This visit should be a foundation for upcoming joint training exercises which underline the strategic partnership between our two countries,' Mr Fry said. 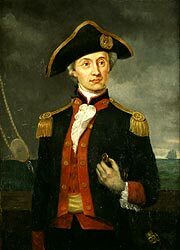 The Nicholas frigate is named after Major Samuel Nicholas, who served in the US army on the same ship as John Paul Jones. City news archive for 03 July' 2003.